One of the hottest trends heading your way in 2013 is something called “earthing” and I can’t help but remember that I grew up “earthing” and didn’t even realize it. Emerging research indicates this planetary energy does boost the body’s self-healing mechanisms by reducing inflammation and pain, improving sleep, and helping defuse stress. Maybe being “down to earth” is best after all. Down here in Mississippi we didn’t wear shoes from May until September unless it was to go to church. And one of our favorite pastimes was to sleep out under the stars in Linda Robinson’s drive-way during spend the night parties. We were “earthing’” fools and didn’t even know it. For sure, I don’t remember feeling any stress in those days and I never heard the word inflammation. That malady was still 35 year off for most of us. Ideal locations for earthing are on the beach, close to or in the water, and on dewy grass. My girlfriends and I are planning a weekend in a remote cabin out around Tibbee Creek in Clay County – to do a bunch of earthing. I heard a bottle of wine is a great accompaniment to an evening of earthing. We’ll test it out and let you know. This entry was posted in Boomerang & the old gang and tagged Earthing is 2013 buzz word, Improve health wby earthing, Ready to go earthing by Emily Jones. Bookmark the permalink. OMG, I’m an earthling too, but I no longer like to sleep on the ground. Barefoot in the grass is still heaven! 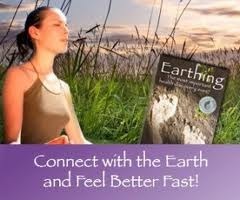 I am a distributor of Earthing, in Denmark that is (http://barfodet.dk), so I do not benefit from recommending the Earthing products on your site. I am 67, sleep on an Earhing sheet and can tell you, that have never slept so well. I recover much quicker from hard physical work , being it in the garden or the gym. Furthermore, in spite of my age, I do not need the bathroom during the night. And i share my experiences with a majority of my customers. However, one this is important to mention. Some people experience the benefits in a few days. Others need months. Anyway, check out earthinginstitute.net and vibrantvillage.com for more information. Mother Earth has more to give than we can imagine. So let’s take good care of her.